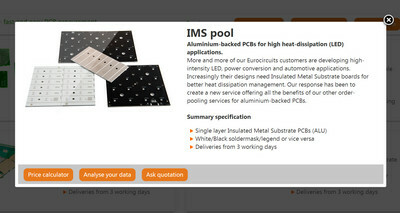 New web site, new PCB services => new prices. Prior to the launch of our new website, we took the opportunity to review every aspect of our pricing structure to make sure that we were providing the best overall deal for our customers. Let’s look at the major changes. To offer good prices for prototype and small batch PCBs we use order-pooling production technology. Order-pooling means that we combine several orders with the same technical specifications onto large production panels. Within the pooling panel, circuits are priced by their size (the amount of the panel each circuit occupies) and by their “pooling efficiency”. Smaller circuits are more efficient as they allow a better material utilization on the panel; the better the panel utilization, the lower the cost of the individual circuits. For the review of our pricing structure, we analyzed several years of panel utilization statistics. As a result, the new pricing structure reflects more accurately the true cost of production on the shop floor. 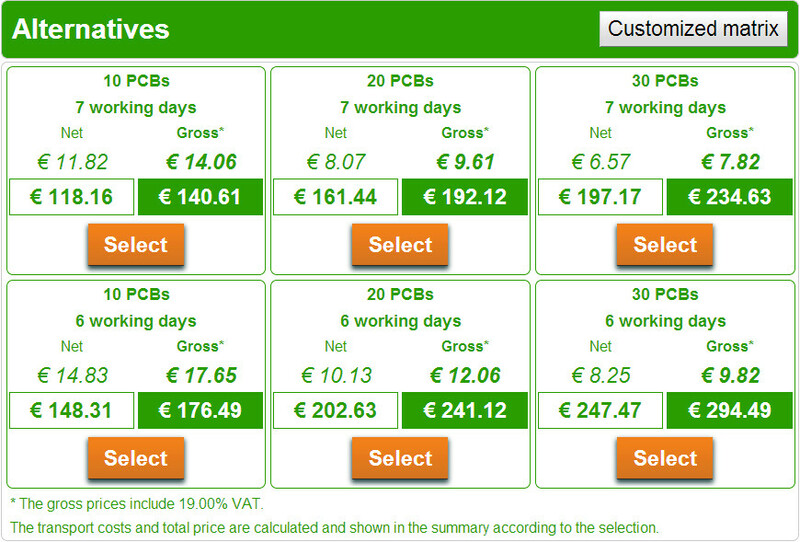 We have held or reduced prices for smaller PCBs (100 x 80 mm or less). Larger circuits and delivery panels pool less efficiently so there is more wasted material. For these boards prices increased somewhat. However, an accurate costing system is your guarantee for reliable prices and continuity of service for the future. To guide you towards the most cost-effective combination of price and technology, if you select an option that introduces extra cost, one of the coin symbols will appear. The small coin symbol means that the option is poolable. The double coin symbol means that the option is not poolable, and will be charged on a whole panel basis. Bare Board Testing is now included in the price for 2 layer boards. Previously this only applied to multilayer boards. BBT is now only a chargeable option for 1 layer boards where it is rarely required. We have simplified the pricing of customer delivery panels. V-cut, break routing, panel without cross out, different images on one panel etc.- none of these affect the price. Pooling now includes more build-ups which were previously not poolable. More predefined poolable build-ups keep down costs where specialist build are required. Bringing all technical classification options of STANDARD pool, TECH pool and On Demand for FR-4 boards together in one service STANDARD pool creates a more gradual price increase for higher technology classes than the standard class 6C. Now also in between classifications are possible like 6D or 7D in pooling, making sure that extras are only applied as the DRC on the data requires it. We no longer make any price difference between 0, 1 or 2 white legends on the board. In advanced options, only Carbon contacts, Press-fit holes and Heatsink paste are non-poolable options. 7WD is now the standard delivery term, regardless of the number of layers. This introduces a significant price reduction for multilayers delivered in up to 7WD. For these orders 10WD is now the standard delivery term, regardless of the number of layers. This introduces a significant price reduction for all orders delivered in 10WD as the old standard delivery term was 25WD and 10WD carried a premium. 15WD is now the standard delivery term for these orders, regardless of the number of layers. This introduces a significant price reduction for these orders delivered in 15WD as the old standard delivery term was 25WD and 15WD carried a premium..
e. Order surfaces equal or larger than 1.000dm² have as standard delivery term 20WD. One of the parameters determining pooling possibilities and efficiency is the quantity. To rationalize the options and to achieve better results here we favour a set of rounded quantities: 1 – 2 – 5 – 10 – 20 – 30 – 40 – 50 – 100 – 150 – 200 – 250. Any of these quantities will give a small to more significant discount depending on the delivery term. The discount for preferred quantities is higher for shorter delivery terms. In the automatically presented alternatives on the bottom right of the calculator, we will always present preferred quantities and better priced delivery terms as well as one shorter than asked whenever possible. The formula for the price calculation of the stencils has been changed bringing prices down in general. Stencils that are eC-registration compatible are favorite. 6. Limits of our service. We would like to again point out that our strength lies in prototypes and small series. To ensure that we can offer a full service to all our customers all of the time we have limited the area of board available for each combination of layers and delivery terms. The following table shows these limits in dm² per layer and delivery term for the automatic online calculation system. Combinations outside these limits might be possible depending on the production loading in our factories. Ask for a quotation if you require something special. Finally by making our prices as competitive as possible with respect to the real costs of production, we offer a WIN-WIN situation with you, our customer. Ordering a PCB online needs to be straightforward and fast – engineers and buyers are always under time-pressure. It needs to be accurate so that there are no delays while data issues are resolved or worse, incorrect boards delivered. It needs to be smart, guiding the customer to the best combination of technology, delivery and price. Cost-pressures across the industry mean that fabricators must work continuously to keep prices down, but at the same time the pricing structure must be accurate, reflecting the true costs of production. Only an accurate price structure can give the customer a reliable cost-base for future planning and the manufacturer the resources to invest in the new technology his customers will surely require. Our new ordering menus been designed to meet these goals. Changes to our pricing structure are highlighted in our blog on pricing logic The new data checking procedures are described in more detail in the blog introducing PCB Configurator. This blog looks at the new service structure. What does this mean? We specialise in prototype and small batch PCBs. We need a cost-effective production strategy to handle a large number of small orders (over 60,000 in 2012). The solution is order-pooling – we combine different orders with the same specifications on large production panels. Sometimes called “panel sharing” or “order combination”, pooling orders cuts manufacturing costs. It streamlines production, optimises material utilisation, and spreads tooling and set-up costs. The result? Lower prices and we don’t charge for tooling. Successful pooling depends on having enough orders of the same specification to be able to fill the pooling panels. Thanks to our expanding user base we have been able to add many more options to our STANDARD FR4 pooling service. Many options which previously had to be individually costed and quoted can now be priced and ordered directly online. This can save up to 24 or so hours on time-critical jobs. Of course our customers still need some options which are not ordered often enough to make pooling feasible. The new ordering structure can cope with these. The Technical Overview includes columns for “non-poolable” options. A “non-poolable” option in a pooling service may sound a bit strange, but it means that in a single menu you can access the whole range of technology options, both poolable and non-poolable. Now you can compare directly the costs of different technologies and find the solution which offers the best combination of performance and price. Not only that, the services also include smart menus which actively flag an option which increases the price of the PCB. If you select a non-poolable option a double coin symbol will alert you. Hover your mouse over it to see the explanation. Non-poolable options cannot share the cost-benefits of pooling, but we still offer our customers a flexible solution. We need to make the order in whole production panels. 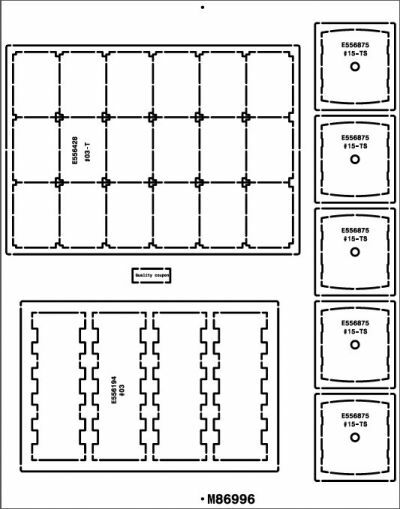 For the same price you can order as many circuits as fill the panel. The new ordering menus include new features to ensure faster and safer ordering, to guide you to the best prices, to reduce the risk of deliveries being delayed by data issues, and to cut down the amount of data you need to enter by hand. These are all explained in our Configurator blog. Dedicated designer prototype service – fast and low cost. 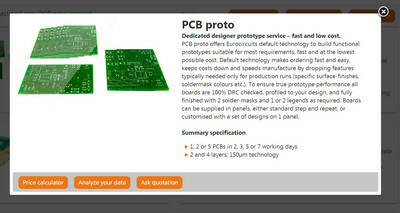 PCB proto offers Eurocircuits’ default technology to build functional FR4 prototypes suitable for most requirements, fast and at the lowest possible cost. Default technology makes ordering fast and easy, keeps costs down and speeds manufacture by dropping features typically needed only for production runs (specific surface-finishes, soldermask colours etc.). Our STANDARD pool service covers your needs for standard PCB production up to 16 layers using design technology down to 90 microns. A single clear smart menu structure gives you immediate access to our wide range of pooling and non-pooling options. The menu will flag non-poolable items, so that you can change them for lower cost pooling options where possible. Pooling prices are based on panel-sharing. Non-pooling prices are based on a production panel specific to the option and the job. Boards can be supplied as single circuits or panels. The standard price matrix shows alternative (lower-cost) quantities and deliveries, or set your own custom matrix. See full specification here. 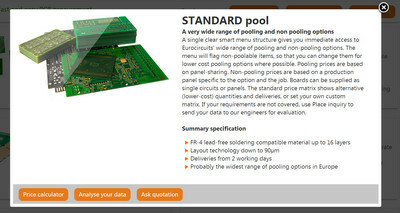 Eurocircuits’ “RF pool” service offers the cost benefits of order-pooling to designers of RF PCBs. 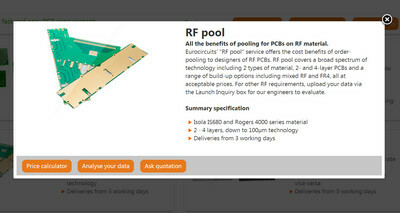 RF pool covers a broad spectrum of technology including 2 types of material, 2- and 4-layer PCBs and a range of build-up options including mixed RF and FR4, all at acceptable prices. See full specification here. 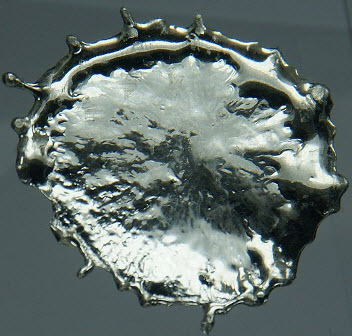 RF pool uses Isola I-TERA as the base material for order pooling. I-TERA has been developed by Isola to provide a lower cost solution for commercial RF and microwave PCBs. It offers excellent electrical properties, stable over a broad frequency and temperature range. More information about this material on the Isola group website . We offer Rogers 4000 series materials as a non-poolable option. Aluminium-backed PCBs for high heat-dissipation (LED) applications. More and more of our customers are developing new designs for high-intensity LED, power conversion and automotive applications. These need Insulated Metal Substrate boards for better heat dissipation management. To meet these customer demands we have created a new service offering all the benefits of our other order-pooling services for aluminium-backed PCBs. See full specification here. Conflict minerals are minerals originating from areas of armed conflict and human rights abuse, notably in the eastern provinces of the Democratic Republic of the Congo. These minerals are traded through middlemen from neighbouring countries, so countries where conflict materials can originate from include also Angola, Burundi, Central African Republic, Congo Republic, Rwanda, Sudan, Tanzania, Uganda, and Zambia. 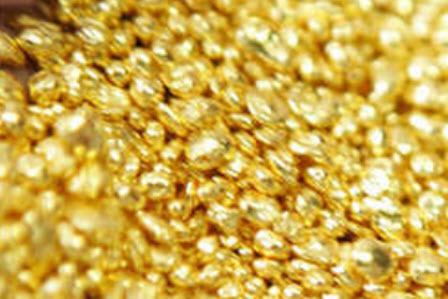 The most commonly mined minerals are cassiterite, wolframite,coltan, and gold, which are extracted from the Eastern Congo, We are concerned about cassiterite (basis for making tin) and gold, as these metals are used in our production process. We contacted our suppliers for these metals and got confirmation that the material we receive from them do not origin from conflict areas. Based on this information we can issue a conflict minerals declaration. How to pilot the eC-reflow-mate? First we need to understand that the eC-reflow-oven is a chamber oven and that principles of thermal inertia apply. Then there are solder profiles. On the left hand side we see that the bottom heater is set to follow the top heater with a difference of -40°C. So a top heater reading of 200°C would steer the bottom heater to 160°C. (more about pre-heater). The reflow TAL time is set to 15 seconds. This means that when reaching the highest temperature point in the curve, the oven controller will keep that temperature for at least 15 seconds. When this function is set, the oven will heat until the highest temperature is reached, regardless in which time frame. It will hold the temperature for 15 seconds in this case and then jump back to that highest point in the curve and continue the rest of the curve. (see also eC-reflow-mate hold time and eC-reflow pilot hold time). The curve itself looks unsmooth and when performing a solder test we can see that the temperature shown in the temperature scope in the bottom part of the screen, does not follow the theoretical curve at all. What is happening? Controlling the oven is like driving a car. The first step we step in our curve is jump to 100°C in a few seconds. That is not going to happen. It”s like pushing the gas lever of your car when the traffic light turns green. The car is not jumping from 0Km/H to 70Km/H in 0 seconds flat. It needs time to accelerate. The oven reacts in the same way. Telling the oven to heat up, will launch a current through the Infrared lamps. This current will heat up the lamp wire which then will start to heat up the oven and the board. It will take some time. The second section of the curve reflects a slow acceleration. After you have told your car to accelerate, you release somewhat the gas lever, giving your car time to accelerate slowly to the 70Km/H desired. The same you do with the oven. Whenever the oven reaches the highest point of the curve depends on the type of board you are soldering. Heavy copper boards will require more time. Time is exactly the only parameter to manipulate the curve: “time”. When you do not know how a board is going to react, it is best to solder it using the external sensor and thus measuring the temperature on board and using the reflow TAL function, explained above to guarantee that you reach the reflow temperature. Cool down, open the door. The next point is the door open point. The temperature will never drop like we define in the theoretical curve. What we set is “hit the brakes” like we do with our car when we see a red traffic light. Only in case of the oven it means that we stop heating. From that point on the oven will cool down very slowly as he is very well insulated. From the moment that the temperature reaches the temperature set in the door open point, the door will open. The door open point is temperature controlled and not time controlled as we need to be below solder temperature before we open the door thus no components will move anymore. Last week from the 28th till the 30th of May, the BENELUX electronics industry came together in Utrecht for the biannual event EA-beurs. With 4.356 visitors over 3 days, the exhibition counted 500 visitors more than the last edition in 2011. 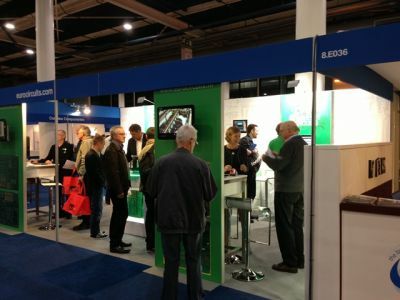 We registered 810 visitors on our booth which kept us very busy. 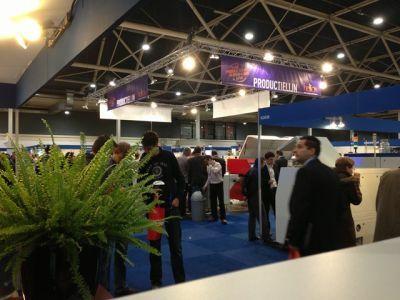 Every m² of exhibition space was fully occupied in de Jaarbeurs Utrecht, offering visitors a nice buzz of activity. Our customers could register for a free ticket for the exhibition through our website and via links sent in pre exhibition mails. 331 people effectively did so. 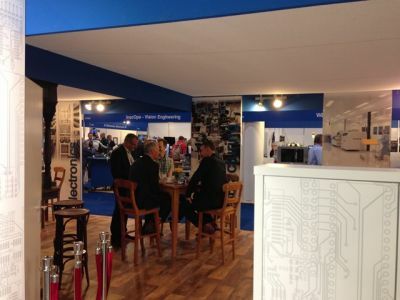 Over the 3 days 201 visitors entered the exhibition with their pre registered Eurocircuits ticket. 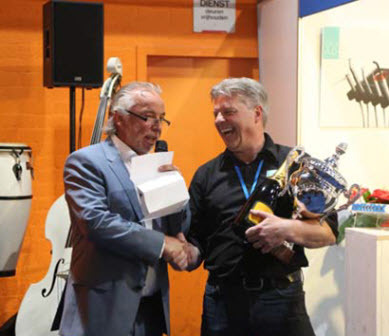 This number proved to be undefeated by other exhibitors and thus for the fourth edition in a row, the marketing cup went to Eurocircuits. Thanks to all these customers that contributed to this success. The weekend before the exhibition we have launched our new website. The major point of improvement was the introduction of PCB Configurator. It is the new step in the Eurocircuits goes visual strategy, after the release of PCB Visualizer and PCB Checker. PCB Configurator enables the manipulation of the order details to bring them in accordance with the data content before the order is launched. That way we avoid unnecessary misunderstandings and miscommunications. PCB Configurator contains also a very strong engine for technical validations of all available Eurocircuits services. It forms the basis of our new calculation program. In there you will find our complete overview of technical capabilities at your finger tips with prices just a few clicks away. More info in our BLOG: PCB Calculator now integrated with PCB Visualizer and more detailed info will follow later. Rethinking our website made us redefine our services. Today we have 4 PCB services based on their base material. Existing users can see quickly what has changed and all users can find a complete user guide here. This also affected our technical classification which leads to the publication of new design guide lines and new EAGLE dru files. Both can be downloaded from our website. New generation eC-reflow-mate. Just one month befor the exhibition we released our new version of the eC-reflow-mate. This made it one of the hot topics on our booth. More details on what our new generation eC-reflow-mate has to offer can be found in the BLOG we wrote about it. 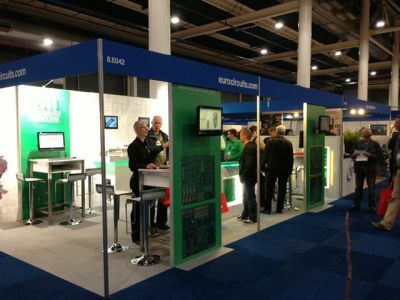 Eurocircuits produced and sponsored all PCBs for the exhibition gadget project “Helios”.Almost 2.000 visitors could assemble the Arduino based “Helios” by visiting 6 predefined booths. Page Electronics, a Eurocircuits customer, pre assembled a part of the boards. The remaining quantity was live assembled on the “live line” in Utrecht. Visitors could see the board emerge from the assembly line and get informed about every production step in the line. Uw PCB data: klaar voor de printplaatproductie? De data die de ontwerper aflevert aan de PCB fabrikant is verre van klaar voor de productie. Elke PCB fabrikant moet er nog een heleboel checks op uitvoeren en aanpassingen aan doen om de data bruikbaar te maken voor productie en er zo de noodzakelijke machineaansturingen uit te genereren. 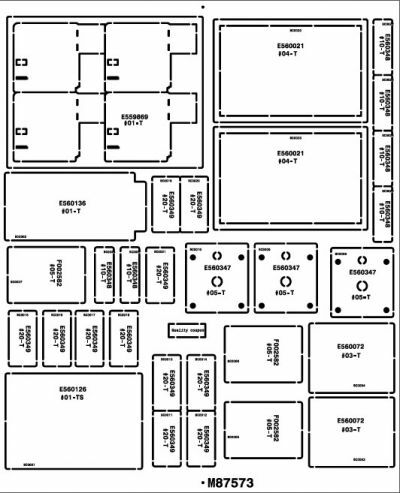 Wat zijn de meest voor de hand liggende basisregels om goede PCB layout data te genereren? Wat zijn de meest voorkomende fouten? Welke tools heeft Eurocircuits ontwikkeld om deze fouten snel te vinden en aan te passen? Een overzicht aan de hand van een praktijkvoorbeeld. Eurocircuits past de traceability filosofie al vele jaren toe in zijn producties. De initiële motivatie hiervoor was om zelf zicht te krijgen op de eigen productieprocessen. Maar in combinatie met de gestroomlijnde online administratie van Eurocircuits, biedt traceability een tweede peiler aan: transparantie van de productieprocessen naar de klant toe. Hierdoor kan de Eurocircuits klant specifieke informatie over zijn product ontvangen. Deze informatie komt rechtstreeks en automatisch uit het traceability systeem. De presentatie gaat verder in op de ervaringen met traceability en wat het oplevert voor de producent en de klant. On the exhibition floor we were captured by the press for an interview. Watch it here! Last but not least, the exhibition was not only a success but it was also a lot of fun being in the midst of our home market between many friends and colleagues and being visited by so many new and existing customers. Our cooperation with neighbour “tbp” contributed again to the positive atmosphere on our linked booths and extended onto the exhibition floor. “tbp” organized the bar, we brought the Belgian beer. We only took back empty barrels and cases. This BLOG is a follow up on our previous BLOG on E&A.